Our new Learner Profile Trait this month is Risk- Taker. We introduced this trait in February because it relates so well to celebrating Black History Month. There were so many people that had the courage to stand up and be Risk-Takers during the Civil Rights movement, even when it was dangerous. 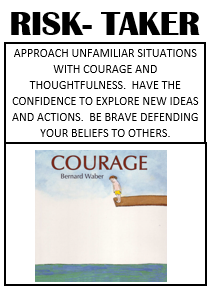 The book we read this month was called Courage. It has many different ways to be positive Risk- Takers. The examples in the book are very practical and range from physical courage (riding a bike without training wheels) to mental courage (being the first one to apologize in an argument). I love the examples that are given and the thinking it promotes from the children. Continue to have these conversations at home about positive risk vs. reward. Something may be “risky” but the reward may be worth it.